The basic theme throughout is that of the Grand Tour, a custom that thrived amongst the upper classes from about the 1660s until the 1840s, when wealthy young men would travel through Europe on a cultural pilgrimage. 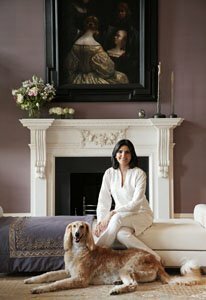 Their tendency to buy vast quantities of mementoes as they moved from country to country resulted in an increasingly eclectic style of interior design that showcased artistic trends from across the continent. Intarya’s graceful design for The Lancasters uses lavish hand-painted wall coverings, bespoke furniture and lavish textures ranging from silk to leather in order to create an atmosphere of diverse exoticism. This must have been second nature to someone with as diverse and fascinating a background as Kamini Ezralow herself. Q Your background and the fact that you have grown up and lived in very different parts of the world must make you a truly international person. How have you incorporated all these experiences and cultural inputs into your work? It’s true. I am a fifth generation South African of Indian origin, raised in Hong Kong, where I attended a German School. I then moved to London to further my education – not only academically, but also aesthetically – the museums, architecture and various landscapes of London provided a new avenue of inspiration to draw from and continue to do so today. My life path then took me to Los Angeles, where I continued my journey of design and encountered ever-expanding fields of inspiration. A completely different landscape and culture embraced me as a designer – from the sun, surf, desert, Hollywood Glamour and a world where anything is possible, at least from a design point of view. I’m now back working in London, but travelling regularly for my work to Europe, North America, Asia, Saudi Arabia and the United Arab Emirates. Being based in London is great for an international designer – it is not only a true melting pot of cultures, but enables access to great design sources. For me, much of my inspiration comes from all around me and from where I come from – my background, upbringing and respective influences have contributed to and somewhat set my foundation not only as a designer, but also for who I am as a person. Today, these influences encourage me to look at things in a new and different way; they continue to shape my personality, life view and design sense. From the smallest details to cultural etiquettes and environments – for me, being aware and respectful of a specific environment helps create a more considered design. Q You use Asian, European and colonial references in your work – has this developed into a personal style or is your work still changing and evolving all the time? Culture and travel references have always been an important source of inspiration for me – I am constantly looking for, coming across and inspired by different cultures both in the past and present. 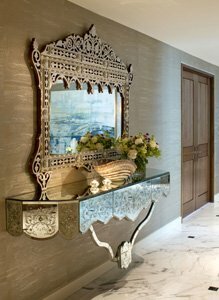 I draw a great deal of inspiration from my Indian culture – the colours, textures and crafts of India have all played an important role in my design. It is also the landscape of the country – from the deserts of the Rajasthan interspersed with the vibrant colours of the national costume encrusted with jewels, to the hues of sandy taupes and tropical greens found in the South. In between there are incredible architectural monuments that blend seamlessly in a sea of colour and texture. Growing up in Hong Kong, the concepts of Feng Shui, of harmony and flow were ever present. Having grown up there and married a doctor of traditional Chinese medicine, these concepts were deepened and expanded in my mind and life as I learnt more about traditional Taoist influences in design. For example, the integration of nature into design and the assimilation of design into nature. Similarly in considering the aspects of Feng Shui and harmony with your surroundings, it is important for me to try and make sure that we follow the natural flow. These are essential and invaluable tools in developing a design scheme. Every project is different as every client is unique – I am constantly growing as a designer with each new project. Learning new ways of expression, implementing old techniques in a new way and layering different textures all contribute to my own personal evolution of design. Q It is very hard to blend modern and classical themes, though when it is done well it can produce stunning designs. Do you have a preference for modern or classical interiors, or is it the matching of the two that you enjoy best? I don’t have a preference, for me it is more about designing for my clients’ lifestyle. In our latest project, The Lancaster’s, part of the brief and inspiration was to blend the historical element of the building and its Grade II listed façade with the best of contemporary interiors and finishes, whilst maintaining a feeling of comfort and homeliness. Function was important – the ability to entertain in a formal setting as well as have relaxed, comfortable surroundings to live in. We created a style that exudes luxury and sophistication, with the use of confident blends of colour and pattern. It is a mixture of the best from old (ceiling heights, traditional style fireplaces, cornicing, skirting etc) and the best from new (designer kitchens, bathrooms and state of the art, though easy to use, technology). We also referred to classical elements such as Chinoiserie, and applied this in a new, unpredictable way – for example, the silk wall covering in the dining room showcasing an over-scaled design in tonal colours with embroidered details. The finished design is unexpected, unique and dramatic. Q What kind of project do you most enjoy working on (e.g. homes, offices, shops, yachts) and what kind of project would you like to try your hand at? To be honest, all projects are enjoyable as they are all so different. I enjoy working closely with clients to achieve a design that is truly and uniquely put together for them – be it a residence, office or yacht. Whatever the environmental context, the design ethos for me is always the same. It is about staying true to the brief, pushing boundaries and above all, it must be about quality. I would love to work on a boutique hotel that would reflect the cultural environment of the location in a fresh and interesting way. Q How would you describe your personal style and what do you try to achieve with the interiors you create? I am particularly fascinated by the design ethos of South East Asia, often incorporating elements of clean simplicity, symmetry and Feng Shui principles into my work. Over the years, I have found that following these basic principles allows a sense of understated elegance and calm consideration to define my work and the environments I create. I don’t typically have a ‘style’ per se. I strongly believe that a good designer is one that can interpret the dreams and aspirations of the client, with a passion to surpass their expectations. A person’s environment should reflect their own lifestyle and personality. However, with all my projects there is a common hand – it is about the layering of textures, the quiet but strong mix of textiles and the integration of bespoke embellishments. Good design is about the ultimate expression of balance and harmony and quality is the foundation on which this is built. I strongly believe that when we design, it is not about our own egos, but about the client. Q Which part is more fulfilling, sourcing wonderful furnishings from around the world or the conceptual design work involved in creating special environments for living, socialising, working etc.? 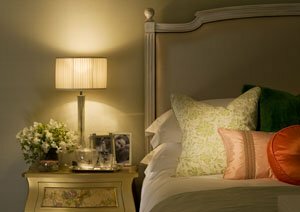 My design ethos is very simple – designing a clients’ home is an extremely intimate process. We hold their lifestyle in our hands and the result must be a home. The dream of being a designer was not only about the appeal of beautiful textiles and furnishings – which are always wonderful to source. It was more of a realisation that as designers we have a responsibility – we can influence how one feels in a room, how one feels when entering a space. 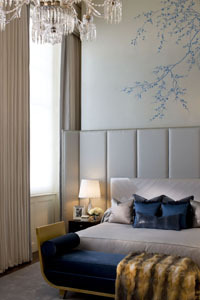 Creating a special environment is crucial for me as a designer – be it geographical or personal in character. When we design, it is equally important to look at the ‘in-vironment’ – listening to the client, watching how they move in an environment, understanding how they want to live. For me, our role as designer is not just about making a space look lovely and appealing; it is about the seamless, harmonious integration of the being into an environment, of an extension of that person’s lifestyle; it is about belonging. Design is after all a ‘sensory’ experience – it’s how one feels in a space designed bespoke for you and how one is perceived in this space. Many think that these are often incompatible issues, however in my experience I have found that when we as designers consider these factors and consciously integrate them with awareness, truly remarkable results can occur. Q In terms of your own preferences, what would your ideal home look like and where would it be located? My ideal home is an environment that encourages space – both physically and mentally. For me and my family, home is about comfort, quiet and retreat, but also very much about entertaining with close friends and family. As to the ideal location – I would have more than one! After all, I am an international designer! This entry was posted on Tuesday, July 26th, 2011 at 12:52 pm	and is filed under Design, Freelance Writing, Interviews. You can follow any responses to this entry through the RSS 2.0 feed. Both comments and pings are currently closed.